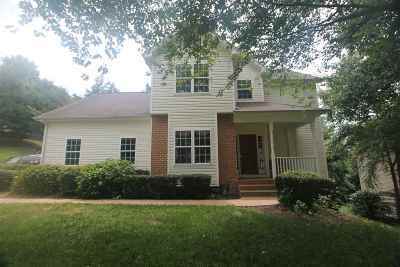 One owner, custom built home in the much desired & convenient Fontana neighborhood just minutes east of downtown Charlottesville & close to Martha Jefferson Hospital, shopping & Darden Towe Park. Home features include an open floorplan, gas fireplace, large kitchen with granite counters/wood cabinets, hardwood flrs,breakfast & dining rooms on the first floor. Upstairs offers a Master Suite with 2 walk-in closets, a loft/office space & 3 additional bedrooms along with a full bath. The walkout terrace level offers a family room, bedroom & full bath. Private deck, shed, side load garage & mountain views complete this fantastic value in today's market. Fontana features a pool, clubhouse, playground, tennis, walking trails & a basketball court.